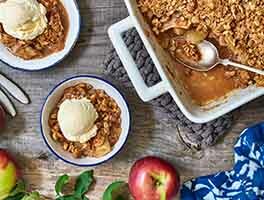 There's nothing that says summer like peach cobbler — even when it's made with frozen peaches! The vibrant orange-gold color of the peaches; the aroma of baking biscuits, and the slowly melting ice cream on top just beg for a warm summer evening on the deck, friends at the table, and cares set aside. Our online baking forum, bakingcircle.com, was graced almost from the beginning by David Lee, a baker who loved sharing his recipes, tips, and baking lore, and was known for his calm, friendly online presence. 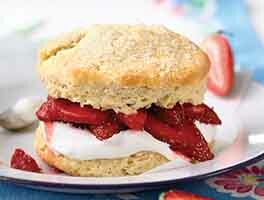 David has sadly passed away, but his cream biscuits — which we use in this recipe — live on. 60 mins. to 1 hrs 15 mins. *If using frozen peaches, be sure they're thawed and at room temperature before proceeding. **Don't have Pie Filling Enhancer? See tips, below. Preheat the oven to 350°F. Lightly grease a 9" round pan. To make the filling: Combine all the filling ingredients, and spoon the peaches into the prepared pan. To make the topping: Whisk or sift together the flour, salt, baking powder, and sugar. Stir in enough heavy cream to moisten the dough thoroughly. You'll probably use about 1 cup in the summer, 1 1/4 cups in the winter, and 1 cup + 2 tablespoons at the turn of the seasons. You want to be able to gather the dough together, squeeze it, and have it hang together, without dry bits falling off. Pat the dough into a lightly greased 9" round pan. Use a 2" round biscuit cutter to cut as many biscuits as you can, leaving them in the pan. Turn the pan over onto a lightly greased or lightly floured surface, rapping it a few times to make the dough fall out. 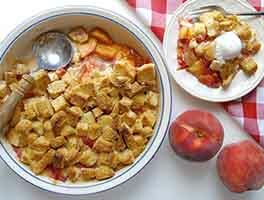 Lift off the pan, pick up the cut biscuits, and space them atop the peach filling. You'll have leftover biscuit dough; shape it into additional biscuits to bake separately, if desired. Brush the biscuits with milk or butter, and sprinkle with coarse white sparkling sugar, if desired. Bake the cobbler for 45 to 50 minutes, until the filling is bubbly and the biscuits are golden brown. Remove the cobbler from the oven, and let it rest at room temperature for about 20 to 30 minutes before serving; this allows the filling to set somewhat. Don't worry, it'll still be warm when you serve it. Scoop the cobbler into serving dishes, including a biscuit with each serving. Top with vanilla ice cream, if desired. Best, easiest, and fastest way to peel peaches? See our knife-free peeling tip. 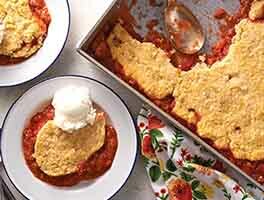 Want to make this cobbler with our easy-to-use self-rising flour? Substitute self-rising flour for the pastry blend or all-purpose flour in the topping ingredients, reducing the salt to 1/4 teaspoon and omitting the baking powder. Reduce the cream to 3/4 to 1 cup, using as much as necessary to make a cohesive dough. Pie Filling Enhancer, a combination of extra-fine sugar, thickener, and ascorbic acid, improves both the flavor of the fruit, and provides the necessary thickening. 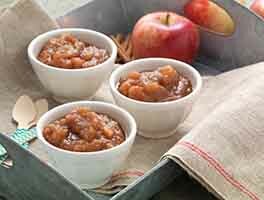 Replace it with 2 tablespoons cornstarch mixed with the sugar before adding to the fruit, if desired. If you make this substitution, increase the sugar in the recipe to 3/4 cup. This recipe is awesome! This was my first time making peach cobbler - I used KA cake flour because it was what I had on hand and the biscuits are to die for! Very easy recipe to follow. The sugar sprinkled on top perfected it. I definitely recommend this recipe and will make again. I'll give it a 4 stars- 5 with the added sugar. We are sweet tooth people. Since I didn't have the pie enhancer I upped the sugar to recommend and the extra sugar was brown which tasted excellent! I also added a dash of cinnamon to the filling and the topping not a lot maybe 1/4 tsp to add an small kick but not enough to overpower the peaches. Excellent! I made the self-rising flour version and it came out great! Everyone in my family enjoyed this delicious dessert, and it really isn't hard to make! This was disappointing. The peach filling was good, but it sat under a barely sweetened biscuit. Weird. I used white peaches as I bought them from the farmers market. I used KAF all purpose and the biscuits came out fantastic. Soft, fluffy and just awesome. I will make this again and again! Oh my good golly gosh, this cobbler is delicious. I used brown sugar for the filling and it turned out perfectly. Nothing is quite so satisfying as the juxtaposition between the sweet, soft, slippers peach slices and the flaky, creamy biscuits on top. Wonderful! Just a wonderful cobbler, easy and delicious. This recipe looks great. I especially like it that you mention that soft flour makes better biscuits. That's the kind of wheat they grow in the South, so that's why their biscuits are so yummy. I do have a question, actually. In the interests of healthier eating, what would happen if one substituted whole milk for the cream? Certainly would be fewer calories. Also, what would happen if we substituted your white whole wheat flour for some of the white flour? I'd be sure to make this much more frequently if it were more 'virtuous.' If this would result in acceptable biscuits, what proportions should be used?